Step 1 Preheat the oven to 350°F. Place 5 greased ramekins* on a baking sheet. Fill each ramekin with about 1/2 a cup of sauce. 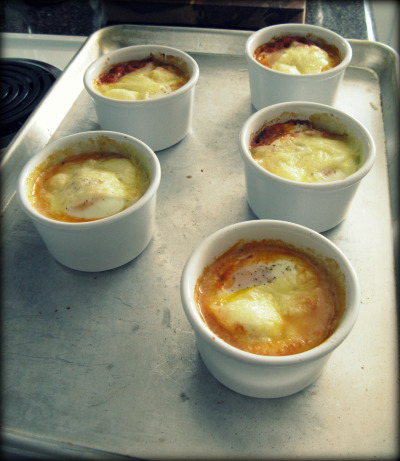 Crack 1 egg into each ramekin and top with a slice of cheese. We use raw cheese, you could also leave it out. Place the baking sheet in the oven and bake for about 25 minutes. Step 2 Traditional shirred eggs leaves the yolk runny. I like runny yolks a lot–but if you cook the yolk all the way through, it turns crumbly and tastes a lot like ricotta filling in lasagna. BE CAREFUL when you take the baking sheet out. Don’t grab the ramekins with your bare hand–yes, I have done this before. Use an oven mitt to place ramekins on a dinner plate, that way you don’t have to hold the ramekin or wait for it to cool in order to eat. *If you don’t have ramekins in your pantry, you could use a muffin tin–just reduce the cooking time. Ramekins can be found on the cheap at places like TJ Maxx, Marshalls and Target. This dish is a take on classic shirred eggs. In my eyes, this could be eaten for breakfast, lunch or dinner. It’s easy to assemble and easy to clean up. I’m writing this recipe for 5 individual portions, but it’s easy to modify for the number of mouths you’re feeding.